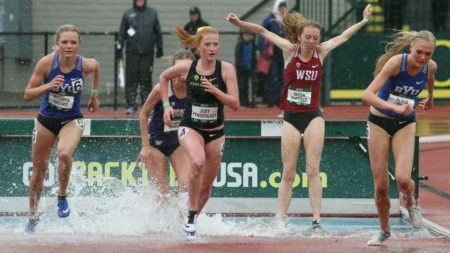 Historic Hayward Field began what will apparently be its swan song outdoor season in fitting fashion Saturday with the 2018 Pepsi Invitational. Hayward and its denizens have witnessed similar conditions in the past but the gusty winds and heavy rain didn’t dampen the competitive effort in the 2018 home opener. One of only two home meets this year and with a full rebuild apparently in store for the legendary facility, the smallish crowd of 3500 or so huddled deep under the roof of each grandstand to witness the last head to head four way collegiate team meet the facility will host. With Washington, Washington State and BYU the invited guests, Oregon’s men and women both put together a solid, across the board team performance to come away with the sweep. The post Ducks Sweep Pepsi Invitational appeared first on DuckNews.com.